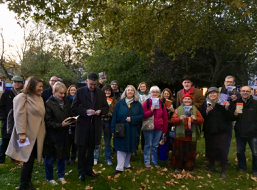 We took to the streets of Peckham on Sunday to celebrate the life of Dame Muriel Spark and in particular her novel “The Ballad of Peckham Rye”. We had a great turnout of more than 20 people, good number of whom had actually read the book! 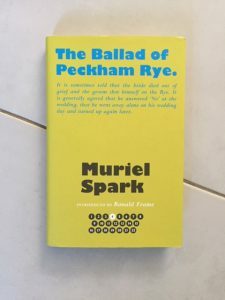 We began by walking up Rye Lane to the Peckham Arch, standing opposite Jones & Higgins, the once grand Department store to which many hundreds of customers visited on a daily basis In the 1950s, the decade in which the novel is set, and when Muriel Spark was a nearby resident in Camberwell. Along the route there, we were able to point out buildings that once housed well-known shops including C&A, British Home Stores and Sainsbury’s. For some participants this was the highpoint but there is a lot more to come. Museum co-creator Nigel Bristow film director and tutor in film at Goldsmiths gave us a synopsis to the novel. We then split into pairs to discuss the novel as we retraced our steps in search of locations mentioned in the novel. We choose the Bussey building as a surrogate for Meadows Meade & Grimley, the first textile factory to employ Dougal Douglas, the novel’s key character. Here co-creator Tim Ingram Smith, adopting a typical Dougal pose, putting a scarf beneath his coat to raise his right shoulder to emphasise Dougals deformity, read from the book. We continued onto the site of the prefabs on Costa Street. Delightfully Mavis Pilbeam and her sister Elsie described the area as it was when their mother was brought up here as a child. Very recently, the last remaining prefab was sold for close to £1 million. One of those rare serendipity moments occurred when participant, Gail Astbury (Tim Ingram-Smith‘s partner) revealed that she had worked with local schools and artist Tom Phillips to create artwork in the small park behind the site of the prefabs. 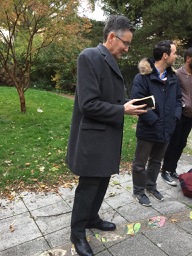 So we went into the park and Tim read a second passage from the book. As twilight began, we moved onto Peckham Rye itself, to a point just beyond where the Peckham Lido used to be. “Dougal peers into the gloom across the Rye” In the novel, the Rye is where fights take place, picnics are to be had in the Old English Garden and would-be lovers court. Turning around, we lent on the railings to look over at The Rye Hotel (as it was called by Muriel Spark) . The group shot, shows a great bunch of enthusiasts thoroughly enjoying discovering not only the novel, something of the life of Muriel Spark, but also what Peckham may have been like in the 1950s. As co-producers of the first Urban Tree Festival, we need to ensure that our own efforts in 2019 compliment and not conflict with the National Park City campaign. 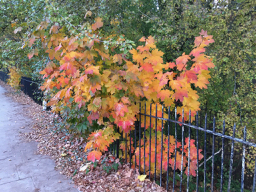 This last week’s listening from the Talking Walking archive, has brought a lovely mix of memories, walking wisdom, and creative thought but what rings through all the podcasts is the value of walking to find space in our busy lives. Bram Thomas Arnold has just completed a PhD based on the theme of walking home, a journey he undertook in 2009 to revisit his Swiss childhood, but when I interviewed him he was collaborating with Eleanor Wynne Davis on project they called “Belgium Transect“. Taking its form from ecology, they dissected the landscape, making music and writing poetry in response to what they encountered. They ‘field broadcasted‘ portraits of their transect at the end of each day. Listen to Bram and Eleanor. I was slightly fearful of meeting Amy Sharrocks anywhere near water, for she’s been known to jump in to canals, ponds and rivers and in her effort to swim across London (with 50 other hardy volunteer recruits), has taken a pre-dawn dip in a lido or two. 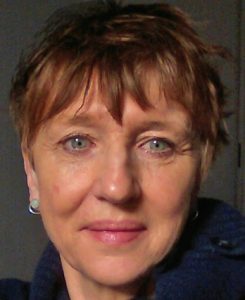 She says her interests lie in journeying, and although I had met her when she volunteered as one of Dee Heddon’s walking librarians, I was actually wondering whether she did any walking at all in her art practice. She is now well-known and well-travelled by her creation of a Museum of Water, for which she explains an early prototype in our interview. Little did I know at the time, that Amy was using the interview as a rehearsal for a judging panel for the Royal British Society of Sculptors, Sculpture Shock Prize, for which she came out as the winner! Listen to Amy here. Ali Pretty has had a hugely successful career as an artist developing work for carnivals, including that at Notting Hill, painting colourful silk banners. She talked about how she wanted to move on to include walking as her practice. And move on she has. Ali gave me the impression that she wouldn’t ever stop walking, becoming a member of the Long Distance Walkers’ Association, who don’t shy at walking 30+ miles in a day, she had devised a 100 mile walk to link the 8 white horses of Wiltshire – these giant etchings in the chalk downland sward. She had collaborated with digital artist Richard White, and together they had produced a geo-located, visually stunning exhibition at the Wiltshire Museum in Devizes. I interviewed her at the back of the Brady Arts Centre in Hanbury Street (close to Brick Lane) in East London when the piece was still in development, but later joined her and Richard at the start of her 100 mile walk for which I couldn’t keep up, let alone go the distance! Listen to Ali here. 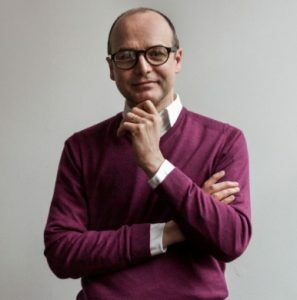 Tim Stonor is an architect and urbanist who heads up a consultancy called Space Syntax, that itself was once a research laboratory at University College London. Space Syntax is a means of forecasting pedestrian movement through our existing towns and is applied in planning new cities an urban extensions. So does this mean that there is no such thing as an unpredictable human? Tim explains that we are fairly simple beings and that ancient cities grew on a grid pattern – which I thought was something that was only revealed in cities built for cars. 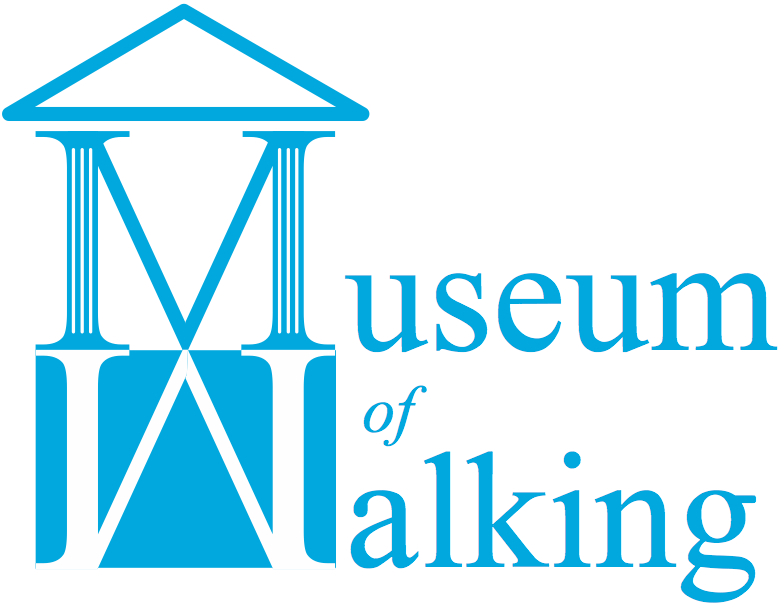 We humans apparently develop patterns of movement that can be predicted – we don’t however, walk to destinations unless they have a particular pull – we are not that daft – so much of Tim’s work is in persuading planners to provide better places for us to walk and better connected routes that link attractions e.g. public transport hubs, shopping, schools, green spaces etc. Space Syntax were heavily involved in the re-configuration of Trafalgar Square, so Tim, although likely to forecast your next move, must be on the walker’s side. Listen to Tim here. Walking through Bloomsbury on an early Sunday morning in the company of Susan Trangmar must go down as one of my most delightful memories of Talking Walking. Susan has been photographing street trees or rather photographing building facades as they are framed by street trees. Many of these trees have lived through the Second World War and bomb damage, others have witnessed considerable changes in the built environment, and Susan sees them as the ‘Invisible consciousness of the city’. Her take on walking is as much abut slow movement as it is about pausing to take a photograph – the pauses allow the sound around you to penetrate your consciousness, and often it’s an unexpected silence that you hear. She sees the combination of slow movement and pauses as a therapeutic walk. Listen to Susan here.